The identification of genetic markers associated with oral cancer is considered essential to improve the diagnosis, prognosis, early tumor and relapse detection and, ultimately, to delineate individualized therapeutic approaches. Here, we aimed at identifying such markers. Multiplex Ligation-dependent Probe Amplification (MLPA) analyses encompassing 133 cancer-related genes were performed on a panel of primary oral tumor samples and its corresponding resection margins (macroscopically tumor-free tissue) allowing, in both types of tissue, the detection of a wide arrange of copy number imbalances on various human chromosomes. 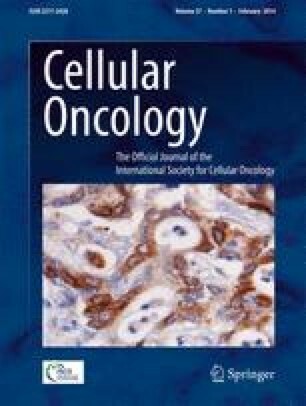 We found that in tumor tissue, from the 133 cancer-related genes included in this study, those that most frequently exhibited copy number gains were located on chromosomal arms 3q, 6p, 8q, 11q, 16p, 16q, 17p, 17q and 19q, whereas those most frequently exhibiting copy number losses were located on chromosomal arms 2q, 3p, 4q, 5q, 8p, 9p, 11q and 18q. Several imbalances were highlighted, i.e., losses of ERBB4, CTNNB1, NFKB1, IL2, IL12B, TUSC3, CDKN2A, CASP1, and gains of MME, BCL6, VEGF, PTK2, PTP4A3, RNF139, CCND1, FGF3, CTTN, MVP, CDH1, BRCA1, CDKN2D, BAX, as well as exon 4 of TP53. Comparisons between tumor and matched macroscopically tumor-free tissues allowed us to build a logistic regression model to predict the tissue type (benign versus malignant). In this model, the TUSC3 gene showed statistical significance, indicating that loss of this gene may serve as a good indicator of malignancy. Our results point towards relevance of the above mentioned cancer-related genes as putative genetic markers for oral cancer. For practical clinical purposes, these genetic markers should be validated in additional studies. The online version of this article (doi: 10.1007/s13402-013-0161-5) contains supplementary material, which is available to authorized users. The authors are grateful to Dr. Artur Ferreira, Director of the Maxillofacial Surgery Unit from Coimbra Hospital and University Centre, for his contribution in the collection of the samples. This work was supported in part by CIMAGO (Center of Investigation on Environment Genetics and Oncobiology - Faculty of Medicine, University of Coimbra).